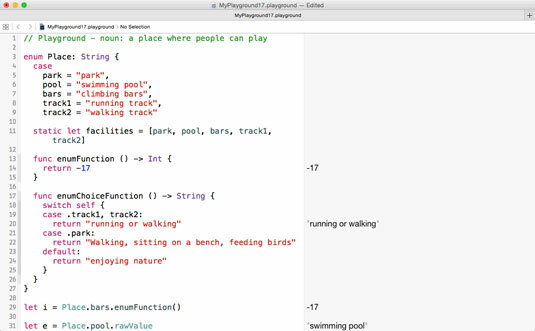 With the same basic code, you can add a function to an enumeration in Swift. This is something you haven’t seen in C and perhaps not in other languages either. It’s a new way of looking at enumerations. That’s true, but you’re not referring to the value returned by the enumeration. You are asking a member of the enumeration (not even an instance of the enumeration) to return the result of enumFunction, which is declared as Int. Swift enumerations are often used in conjunction with switch statements. Here is a function to place inside the enumeration that contains a switch statement. When you have an instance of an enumeration (or just the enumeration itself), you can call an internal function from an element just as you saw in the preceding code snippet. And, like the preceding code snippet, the result returned by the function need not be the same type as the type of the enumeration. In the following code a function that returns a String is based on the result of a switch statement that uses the elements of the enumeration. Note that the elements of the switch are not strings (note the absence of quotation marks and the presence of the leading periods in the case names). return "Walking, sitting on a bench, feeding birds"
The figure shows the code described here. var result: String = "
result = result + amenity.rawValue + ", "